Providing licensed home care agency/registry services, respite care, home and community based services to people living with disabilities. We at Victory Support Services truly care about the people we serve. Since 1998 Victory’s programs have served over a 1000 individuals living with servere to profound disabilities and other related conditions as well as the disabled homeless throughout Pennsylvania before becoming a Home Care Agency Provider in 2006. Please take a moment to review our website at www.victorysupportservices.com for a list of all the services Victory provides. Click on the word Consultation if you wishe to fill out a request for services online. We want to know that your happiness, safety and well-being are of the utmost importance to us at all times. We make every effort to carry out our established mission that every client is entitled to be treated as an individual, with consideration, dignity, and respect, and receive adequate and appropriate care, treatment and services in compliance with Federal and State laws and regulations.You are entitled to be fully informed of your rights and privileges while receiving your services from Victory. We encourage you to ask questions you may have and to make any suggestions you want to me or any other member of Victory's staff. 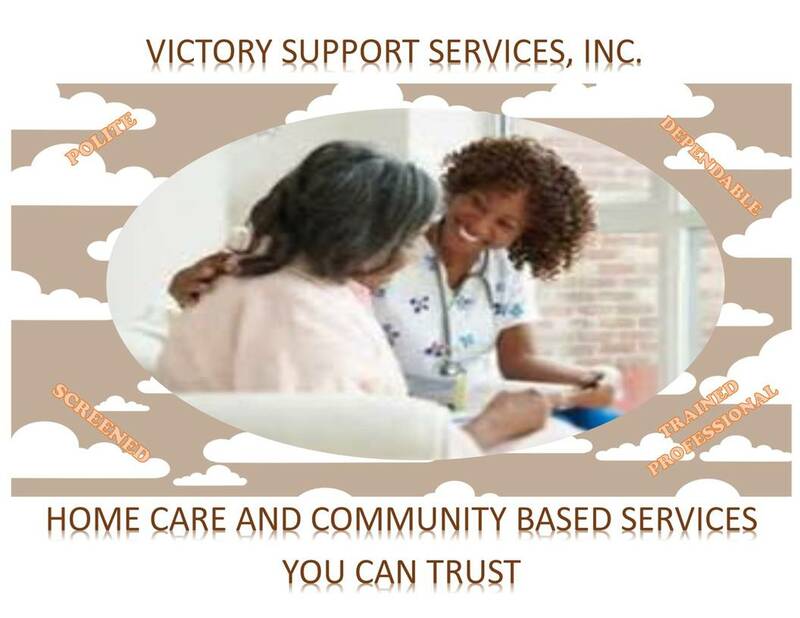 VICTORY AT HOME is our home care agency providing personal care, respite care and daily living services. We can send trained aides to your place of residence to assist you with your activities of daily living such as bathing, dressing, meals, laundry, light housekeeping, assistance with medications,errands and making and getting to appointments.Individual with Medical Assistance, long term care insurances or simply wish to receive services on a private pay basis are welcome to enroll.Consider Victory as an affordable alternative to a nursinf facility and receive personal care and support services right in your home and remain in the community or if transitioning out of a nursing home consider living at Victory House our well appointed residence.Thank you for the opportunity to serve you.